Pep Guardiola is considering his future at Bayern Munich. 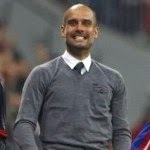 The former Barcelona coach intends to walk away from Bayern when his contract expires in 2016, according to German sources. The Daily Star says the news is likely to alert the likes of Manchester United, Manchester City and Arsenal. Chelsea chief Jose Mourinho and Liverpool’s Brendan Rodgers both seem secure in their roles, but the availability of Guardiola could lead to top brass deciding on a change.